I’ve been cycling more lately, including my fourth annual Tour de Cure on April 25th. However, I opted against writing about it since I spent my free time writing about the ACP 300-km brevet as well as preparing for a May 2nd 400-km brevet. The TdC was relatively uneventful and only served as a training ride for my much longer rides. Since I was still feeling residual discomfort in my neck from the 300k during the TdC, I did an easy ride on Monday and then took the rest of the week off to let my neck heal. I also returned a high-rise stem to service to help get my back and neck a little more upright. I gained about 2-cm. See the difference between the stems in this photo. 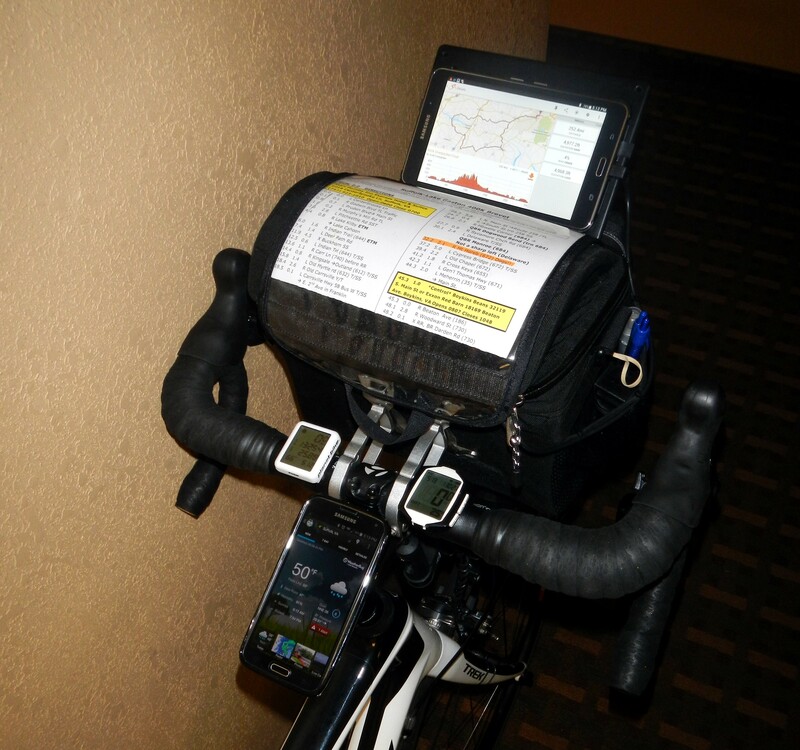 Since the 400k began at the same time and from the same hotel as the 300k, my preparation and plan was nearly the same. The major difference was that I didn’t forget any clothing or gear. 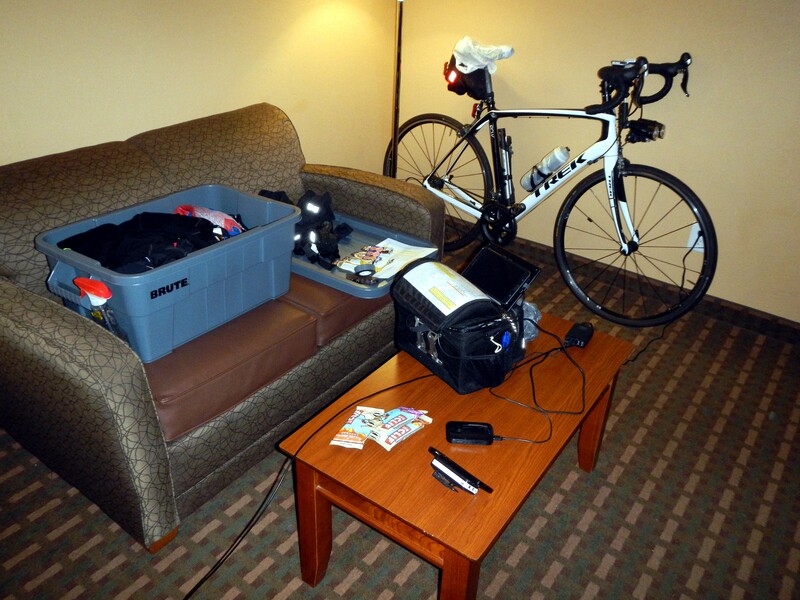 I unpacked, prepped the bike, and plugged in my gadgets to charge overnight. I was actually in bed at a reasonable time. I awoke at 4:30 and then ate the big breakfast I had purchased the previous evening. The temperatures were forecast to range from 45 to 75 degrees, so I had to carry a little of everything in the clothing department. I was prepared! I decided to test a different navigation aid since my smartphone charging port failed during the 300k (I didn’t mention the dead phone when I wrote). Samsung stood by their warranty and sent a replacement, even after nine months. Replacing the phone was really inconvenient, but it compelled me to switch to wireless charging to reduce wear and tear on the USB port. I love wireless charging, but it’s not an efficient use of external batteries on the bicycle. I decided to try another gadget that wouldn’t be as inconvenient to “lose” on a ride if something went wrong: A second-hand Samsung Galaxy Tab 4. It boasts 10 hours of battery life while watching movies. I expected much less battery endurance while using GPS and was prepared with an external battery pack. I ran the RwGPS app and set it up to leave the screen off with the exception of 20-seconds on either side of a turn. As with my smartphone, the tablet read turn-by-turn directions into my ear via Bluetooth headset. Here’s a photo with the 7-inch tablet in place, as well as the smartphone. The phone stayed in my pocket during the ride with both GPS and data disabled. Fourteen riders left Suffolk just before dawn and rode at a surprisingly tame pace of about 15-16 mph. I was quite comfortable at that speed. Two riders took off right away; I think one was pursuing a personal record (he finished in 15h 30m). 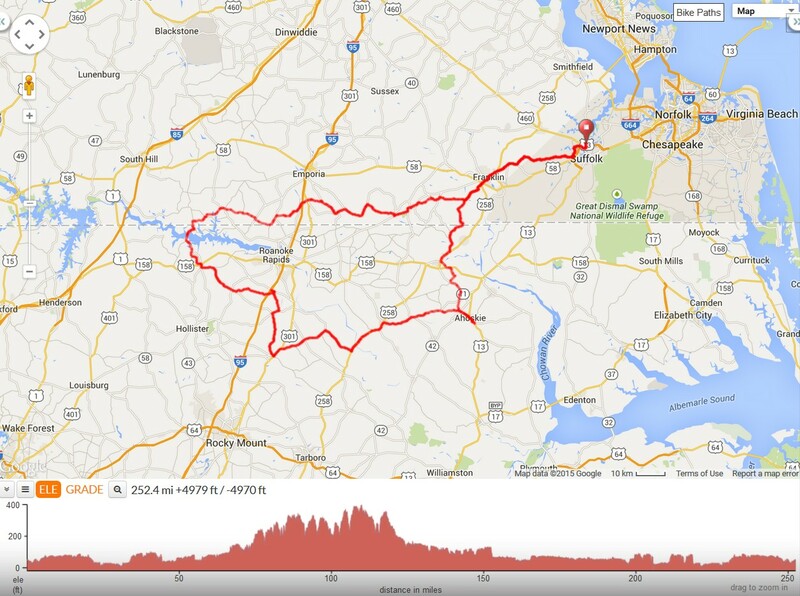 The other 12 of us stayed together and rode non-stop for 45 miles to the first control in Boykins, VA. I had never ridden that far without the need to adjust something, visit a tree, or peel off clothing. The first leg of the ride was PERFECT. Although we all seemed to be riding at similar paces, the control points were where we differed as randonneurs instead of just riders. Some simply collected brevet card signatures and left, some picked up a snack, some visited restrooms, and others (myself included) peeled off some clothing and applied sunscreen. Now the 12 of us were split into smaller groups of two, three, or four riders. I discovered a flaw in the way had I mounted my tablet as we entered Boykins. 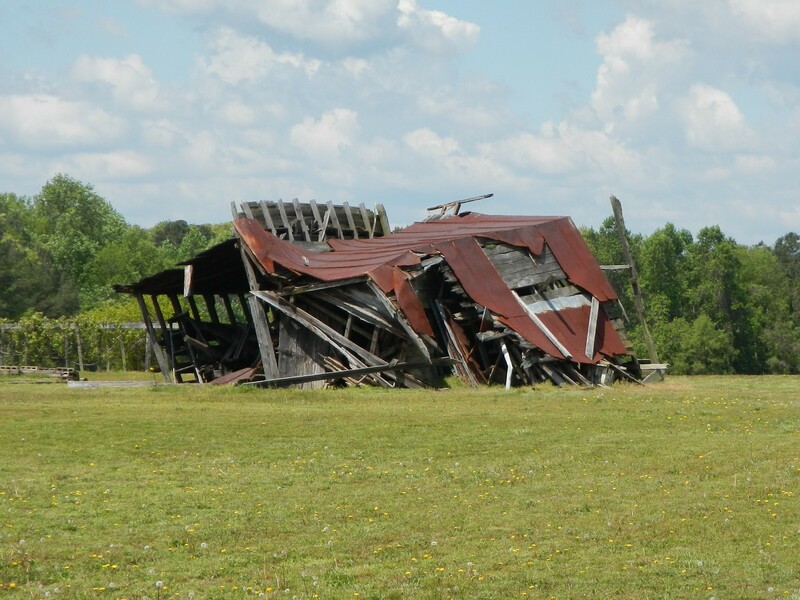 The mount withstood single impacts from the road. However, a series of bumps, such as railroad crossings and particularly bumpy bridges, created an oscillation that managed to fling the tablet out of its mounting slot. Thankfully, the power cord saved it from falling more than 12 inches. 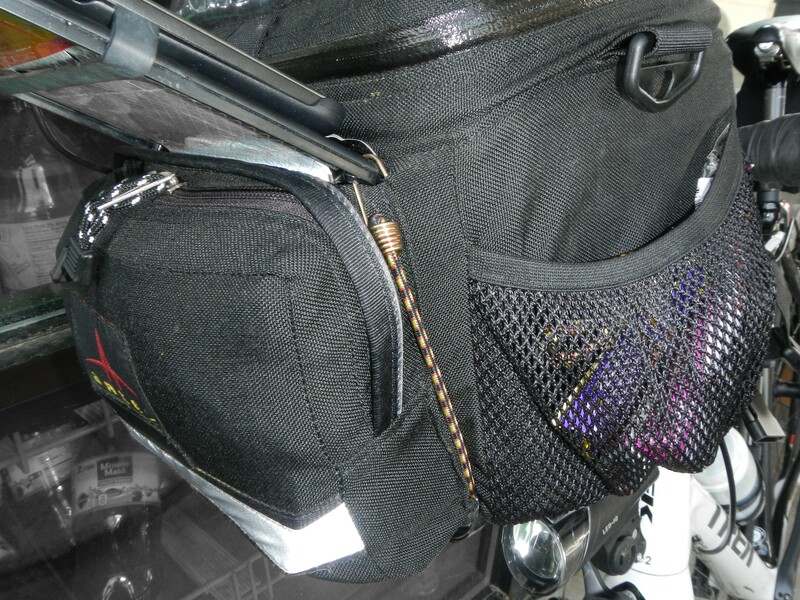 After eating a footlong sub at the 70-mile control in Skippers, VA, I visited the adjacent truck stop to see if they had shoe laces or some sort of drawstring that I could use to firmly secure the tablet to the handlebar bag. I got lucky and found a package of miniature bungy cords. The fix was perfect. However, the delay had me leaving Skippers last and riding alone. My hope was to maintain a decent pace and perhaps catch someone before they left the next control. I entered the hilly section of the route and settled into a fluctuating pace. I ground my way slowly up each climb at 5-6 mph and then blasted along the descents and flat areas. 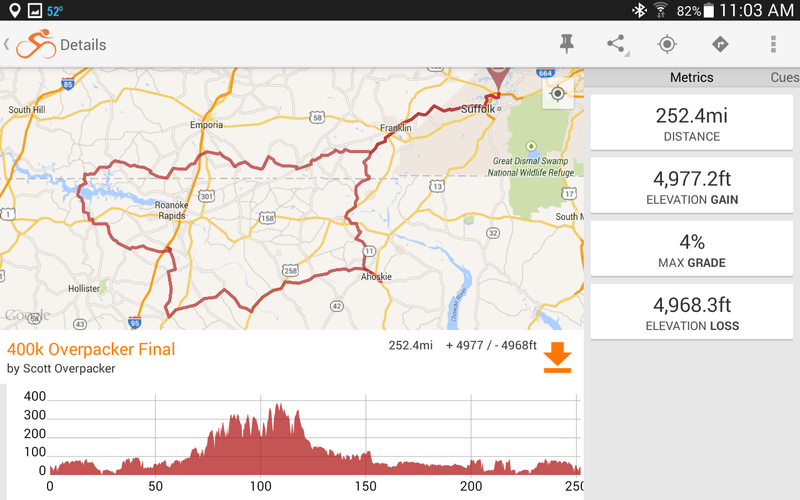 This map shows that the most significant climbs were between the 75 and 117-mile points. 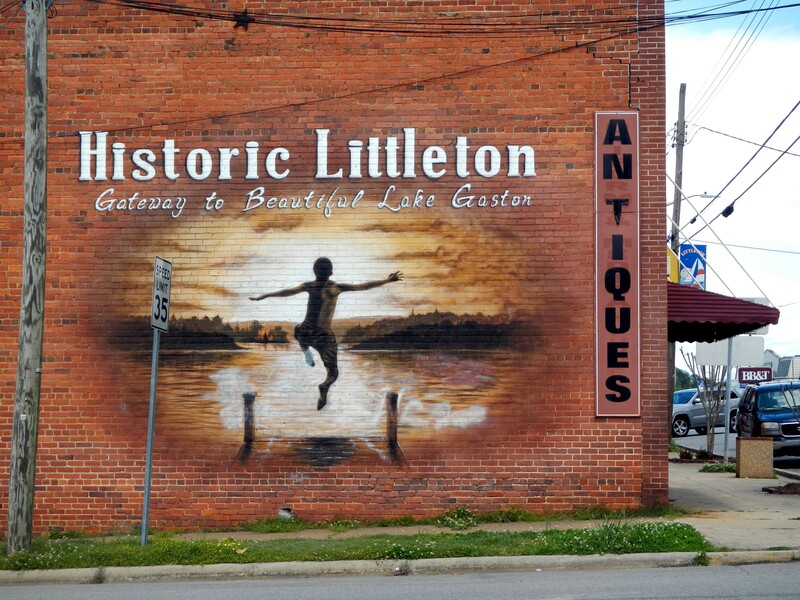 I managed to arrive at the 98-mile control in Lake Gaston, NC just minutes before Jacob A. and Ray R. departed. I didn’t feel like a swift departure to join them. I had an ice cream cone, refilled my water and then left. I reached the final significant climb at 115 miles. I was warned about this 4.8% climb and was glad to see it since it signaled the end of crawling up hills. 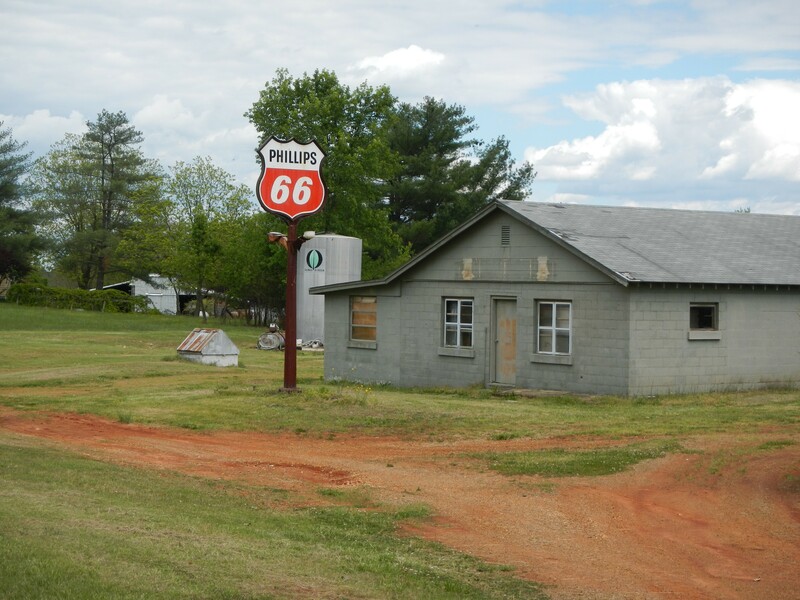 I arrived at the 126-mile control in Halifax, NC while Jacob and Ray were still eating. I grabbed another footlong sub and had a chat with Ray (Jacob left). While I ate, Ray offered to stay behind and continue the ride with me. Night riding is safer in numbers. So I gladly accepted his offer. The next control was only 15 miles away. We maintained a fairly brisk pace along that stretch. We bought plenty of food/fluids at that control because the next leg was 47 miles. 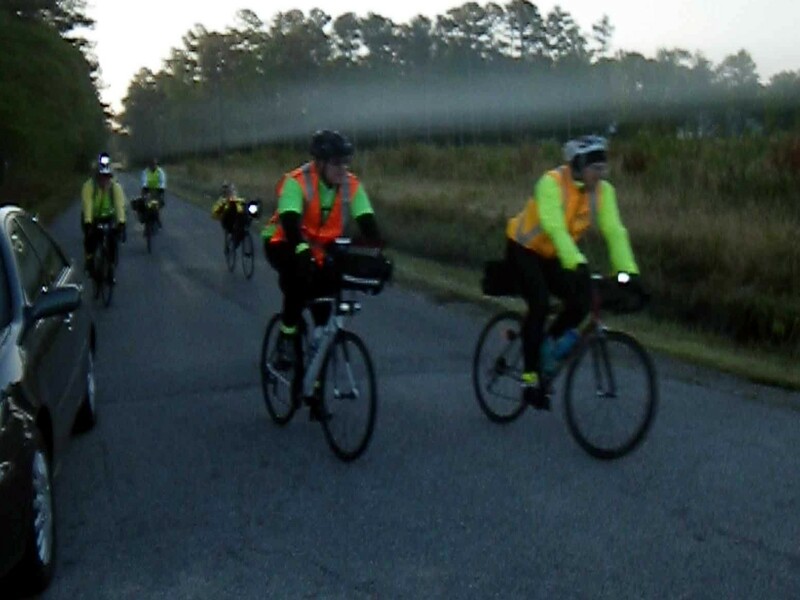 It had been dark for about an hour when we arrived at the 188-mile control in Ahoskie, NC. We saw 4-5 scattered riders leaving Ahoskie as we entered the town. We opted to find the local Subway and ordered breakfast subs. The next leg was 39 miles and would get us to within 25 miles of the finish. It was looking like we’d finish around 3:00 am, well ahead of the 24-hour time I thought I would require. Then I hit a wall of sorts. I think it was after another two hours of riding in darkness. We had a beautiful full moon, but no city lights or civilization to stimulate my mind. I was suddenly overcome with an urgent need to sleep. It was bizarre and perhaps a little frightening. I had the leg power to keep going, but my brain just couldn’t process what I was seeing, forcing me to slow to around 10 mph. I could hardly keep my eyes open. The temps were dropping and, because I had slowed down, I was starting to get cold. I couldn’t imagine stopping to nap in the cold, especially with no apparent places to stop. It was VERY tempting to call it quits. But Ray was very encouraging and wanted me to get this 400k under my belt. Besides, there was no place to abandon the ride. My only option was to keep riding. We finally hobbled into the 227-mile control in Franklin, VA. Our hope was to catch about 30-minutes of shut-eye. My eyes were closed for about 10 seconds before the store manager informed us we could not stay there. I think I was in the store for about 20-30 minutes, hoping that the lights would jump-start my brain. It seemed to work. We continued to the finish at about 14-15 mph. I was starting to feel sleepy again about five miles from the end, but I was too close to my bed to let that stop me. We finished at 3:55 am, which is still two hours faster than I had hoped. The ride was a success! Still, I was in no mood for cold pizza or excessive chit-chat. I was whipped and fading fast; plus, the hotel staff was setting up for breakfast. That was a clear sign that I needed a shower and a bed! I thanked Ray for his company and hoped to see him again, perhaps on the 600-km. I slept until about 9:00 am, packed the car, drove home, and slept more. 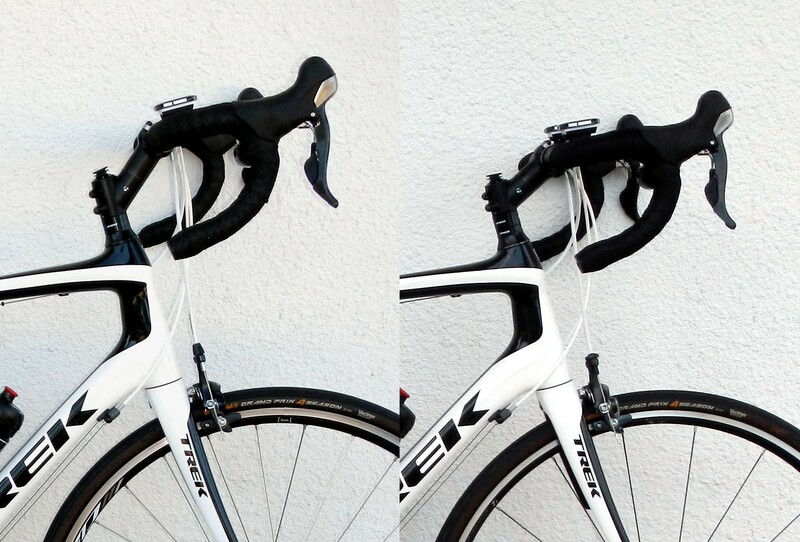 That evening, I created this topic at BikeForums.net to see if experienced randonneurs could comment on my fatigue. While I have seasoned local riders available to talk directly to me, I hope that having the input gathered in one place online may be helpful to anyone who performs an Internet search and finds it. The only thing I haven’t mentioned is the performance of the tablet as a navigation aid. It exceeded my expectations by far. I’m confident the battery would have lasted the entire ride, mostly because I minimized display use and had no Internet connection. It still had 45% remaining at 300 km (15 hours) into the ride, even with a few hours of playing music. I opted to plug the tablet into the external battery just to see how quickly it would charge back to 100%. I don’t recall how fast it charged, but I have every confidence that the external battery can charge the internal battery quickly while keeping up with the demands of the tablet. I also had an extra Bluetooth headset with me so I could wear one while the other was charging. It worked well. In short, a tablet running with downloaded maps is a great idea if you like tech/navigation overkill! At this point, I feel good about my chances of completing the 600-km brevet and becoming a Super Randonneur. The weather during the 400k was almost ideal. That may not be the case in June. I can deal with heat, but wind and rain may make my ride more difficult. Time will tell what kind of 600k I’ll have. I’m looking forward to it! Indeed, hoping for good weather for everyone for the 600. I like your aventure. Can you tell me what stems are you using, angle and reach, in the photo link. Best regards.